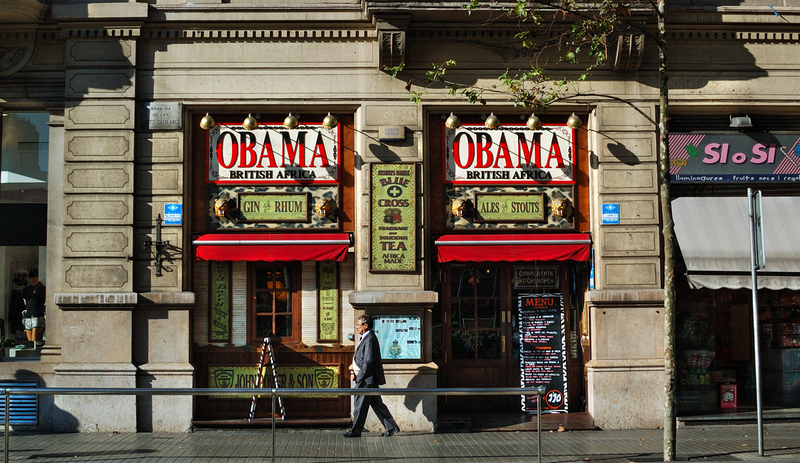 Obama British Africa Pub at Gran Via de les Corts Catalanes, 603 is an interesting place decorated with pictures and sculptures depicting the colonialist past of Great Britain in Africa. Gin, rhum, ales and stouts, the usual thing, you know, but imbued with that special mood. Coincidence or not, to the right of the big flashy Obama signs, the shop next door reads: Si o Si. Obama, Yes or Yes! It is an interesting photo, so funny with all the text.